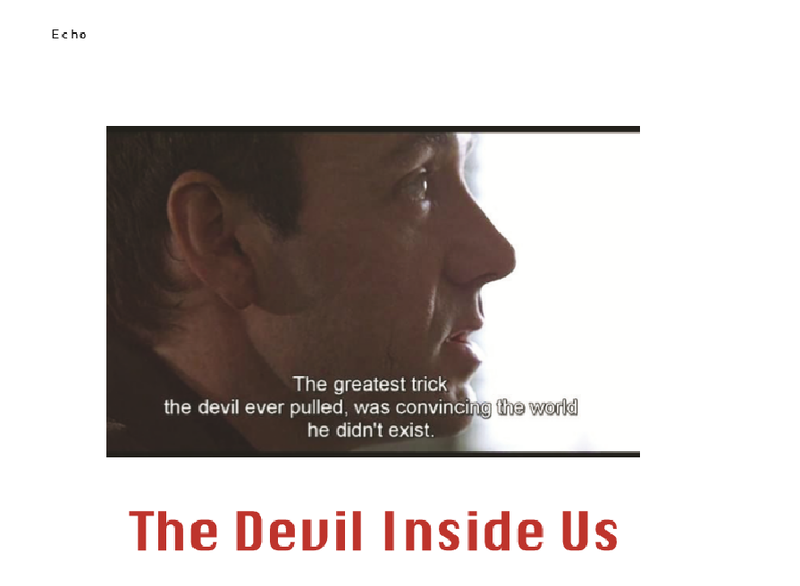 “The greatest trick the Devil ever pulled was convincing the world he didn’t exist.” This quote from the 1995 movie, Usual Suspects, was once a piece of truth, carefully crafted into a delicate sequence of words. It is true. We don’t spend our days cowering over the fact that an ultimate evil is looking up at us. However, due to recent political unrest, one could come to the conclusion that the Devil isn’t looking up at us; it’s right next to us. We all have a Devil inside us, a voice inside our heads nudging us to doom and desperation. For university students, the voice inside their heads is a constant reminder that they aren’t good enough for their dreams. For public officials, it’s an excruciating ignorance of what the public wants, and an obnoxious focus on their own personal needs. These are the issues that this edition of the Hanyang Journal aimed to show to the public. The Devil might be convincing the world that it doesn't exist, but the world is also convincing the Devil that it can never win. Whether it comes to messy politics, or just focusing on one’s self- esteem, getting rid of the darkness all depends on knowing that are powerful lights in the world.